Dubai, UAE, May 27, 2018: Renault Middle East is giving back to its loyal customers in Saudi Arabia and Egypt this Ramadan, by providing them with a chance to win two years free servicing. 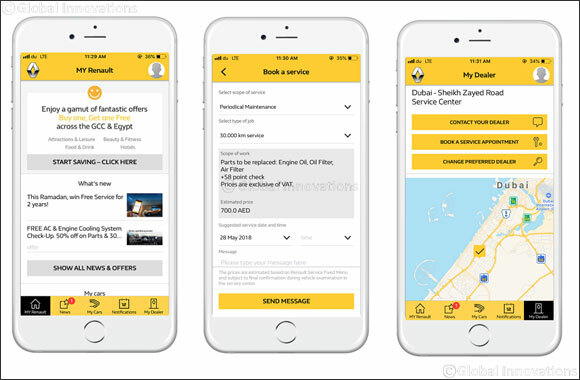 Customers who download the MY Renault app and book a service appointment with one of Renault’s approved retailers in the Kingdom and Egypt will be entered into a draw to win the prize. The special Ramadan offer will run for six weeks. In addition to being entered into the draw for free servicing, customers can also use the MY Renault app to discover the fixed price servicing menu, access car information, easily contact the Renault network and enjoy special discounts and personalized service promotions, as well as access to thousands of The ENTERTAINER buy 1 get and get 1 free offers.